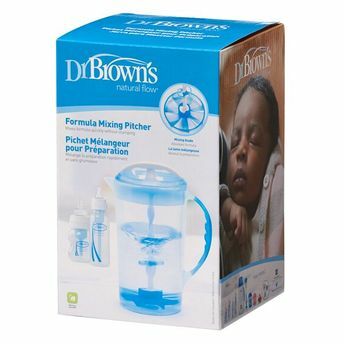 The formula mixing pitcher from Dr. Brown's eases formula preparation by allowing up to 4 bottles to be mixed and stored at one time. This unique feature includes a mixing blade that quickly dissolves formula with no clumping, and an adjustable stopper that prohibits the mixing blade from lifting above the surface of the liquid as to keep air introduction to a minimum. This features a locking lid, soft grip handle, and ribbed pitcher spout that offer comfort and convenience when pouring. Additional Information: At Dr. Brown's, our focus has always been to create innovative baby products to promote good health and optimal nutrition. With best baby products supplied to hospitals and NICUs, Dr. Brown's is a favourite amongst moms worldwide, quite certainly for its quality and class. Explore the entire range of Feeding and Nursing available on Nykaa. Shop more Dr. Brown's products here.You can browse through the complete world of Dr. Brown's Feeding and Nursing .